Chinese Foreign Minister Wang Yi announced Wednesday Beijing has halted land reclamation in the South China Sea, but other regional leaders voiced concerns China was simply moving to a new phase on the disputed islands: construction of outposts. Wang, who made his remarks on the sidelines of meetings involving the 10-member Association of Southeast Asian Nations (ASEAN), also called on countries in the region to speed up talks on how claimant states should conduct themselves in the disputed waters, through which $5 trillion in ship-borne trade passes each year. China said in June it would soon complete some of its reclamation in the Spratly Islands of the South China Sea, and that it would also continue to build facilities on the man-made islands. China said the reclaimed islands would have undefined military purposes, as well as help with maritime search-and-rescue operations, disaster relief and navigation. The U.S. and Japan have expressed alarm at China's expansion in the region, which they suspect is aimed at extending its military reach. In meeting with Wang earlier Wednesday in the Malaysian capital, Kuala Lumpur, U.S. Secretary of State John Kerry again expressed concerns over China’s massive island-building efforts in the South China Sea. A senior State Department official said Kerry reiterated his concern to Wang about rising tensions over disputed claims in one of the world’s busiest shipping lanes and China's large scale reclamation, construction and militarization of features there. "The United States shares the frequently expressed desire of ASEAN members to preserve peace and stability in the South China Sea," Kerry said in opening remarks at the ASEAN-U.S. ministerial meeting. According to a statement from the Chinese foreign ministry, Wang told Kerry: "China is always committed to working with the countries concerned to resolve disputes through peaceful negotiation." When asked by a reporter whether China would temporarily halt reclamation work in the strategic waterway, Wang replied: "China has already stopped. You just take an airplane to take a look." However, Philippine foreign ministry spokesman Charles Jose said China had stopped reclamation because it had already formed its new islands. "At the same time, China announced they are moving on to Phase 2, which is construction of facilities on the reclaimed features. The Philippines views these activities as destabilizing," Jose said. In a statement, Minoru Kiuchi, Japan's senior vice foreign minister, "voiced deep concern over unilateral actions that change the status quo and heighten tensions in the South China Sea, including large-scale land reclamation, the construction of outposts and their use for military purposes." U.S. Secretary of State John Kerry speaks during a meeting with youths from the Association of Southeast Asian Nations (ASEAN) region in Kuala Lumpur, Malaysia, Aug. 5, 2015. Recent satellite images show China has almost finished building a 3,000-meter-long (10,000-foot) airstrip on one of its seven new islands in the Spratlys. Beijing claims most of the waters, while the Philippines, Vietnam, Malaysia, Taiwan and Brunei have overlapping claims. A senior State Department official said Kerry and Wang also discussed concerns of cyberspace, human rights issues and President Xi Jinping’s U.S. visit in September. At the ASEAN forum, Kerry also hosted a session of the Lower Mekong Initiative, a training and capacity-building project that involves Cambodia, Laos, Thailand, Vietnam and Myanmar, which is also known as Burma. 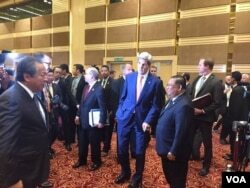 Later Wednesday, Kerry will also meet with Russian Foreign Minister Sergei Lavrov on the sidelines of the ASEAN forum. The State Department said they will discuss a number of issues of mutual concern. Kerry entered the forum using a cane instead of crutches – a first since he broke his leg in a June biking accident. In comments at one session, he said the cane was loaned to him by former President John F. Kennedy's family and dated back to Joseph Kennedy, who served as U.S. ambassador to England. Kerry is in Southeast Asia to stress the importance of U.S. trade and investment, and links to prosperity for the Asian and U.S. economies. He arrived in Kuala Lumpur late Tuesday from Singapore, where he held talks with officials on issues including the proposed Trans-Pacific Partnership (TPP), a massive 12-nation trade plan. In a speech at a Singapore university, Kerry said trade ministers involved in TPP talks had made "good progress." However, the ministers failed to reach a final agreement during talks in Hawaii, last week. Kerry started his five nation-tour, which included stops in Egypt and Qatar, last Friday. After visiting Kuala Lumpur, Kerry will wrap up his trip in the Vietnamese capitol, Hanoi. He will mark the 20th anniversary of renewed bilateral ties that were severed four decades ago as the protracted Vietnam War came to an end.